The old Empire Sports Ground during the 1925 Cassar Cup final. This week’s photo takes us back to the 1920s when the game in Malta was at an all-time peak. Those were the golden days of Maltese football when attendances of 12,000 to 15,000 were a common norm. 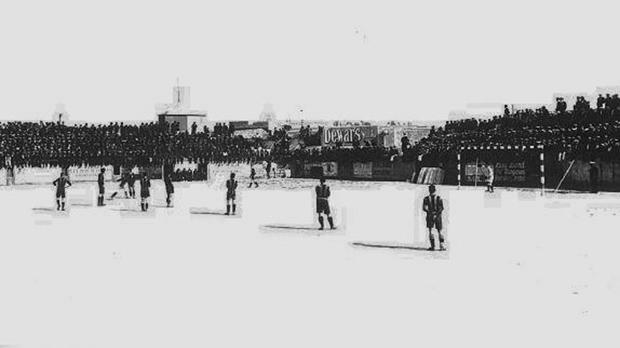 A look at the photo will confirm this as swarms of supporters can be seen lining the curves of the old Empire Sports Ground for the 1924-25 Cassar Cup final between Sliema Wanderers and the Fourth Flotilla XI. That season the great rivalry which existed between Floriana and Sliema Wanderers in the league was carried over to the Cassar Cup, in those days considered by many to be the unofficial all-round championship of Malta. On the Services side, the East Lancashire Regiment and the Fourth Destroyers’ Flotilla qualified to represent the Army and Navy, respectively. Both teams had a very good side and this added more interest to the competition. The total revenue from the previous season’s competition was only £280. This was a very small sum even for those days, especially when one takes into consideration that the semi-finals both ended in draws and had to be replayed. One of the reasons behind the poor revenue from the 1923-24 competition was the fact that Floriana were not allowed to take part. Another reason, however, was that the entrance fees were increased to 1/6d, 1/- and 7d. These prices were very unpopular with the Maltese and they protested by staying away from the stadium when the Cassar Cup matches were played. In 1924-25, Floriana won the championship so they qualified outright for the competition. Their partners to represent Malta were, of course, the Wanderers and this could not help but increase handsomely the gate-money. In the first semi-final, Floriana met the Fourth Flotilla team. No one gave the Navy team a chance against the Greens, but the sailors had other ideas and goals by Mann and Allen gave them a 2-1 victory. Incidentally, the Fourth Flotilla were the first Navy team to reach the cup final. Floriana’s goal was scored by veteran Salvu Tabone from a penalty. Sliema Wanderers were the holders of the Cassar Cup. They were hard pressed to beat the East Lancashire Regiment but in the end a goal scored by Conti gave them a hard-earned victory. Sliema: Nicholl, Fearne, Hartley, Psaila, Caunter, Sevasta, Rule, Strickland, Busuttil, Conti, Calleja. Fourth Flotilla: Owen, Gibbs, Matthews, Nuttal, Bailey, Russell, Allen, Mann, Creswell, North, Hammond. Referee C.S.M Standworth signalled the start of the match at exactly 4pm. The first half was all for the Navy team although Sliema had a couple of good attacks to their credit. At one time, Fourth Flotilla protested for a penalty but referee Standworth waved play on. Minutes before the end of the first half, a hard shot by Mann was well saved by Joe Nicholl. In the second half the initiative passed to the Wanderers who attacked much more than their opponents. They seemed determined to take the honours and succeeded when Frankie Busuttil scored the winner with a fine shot from just inside the box on 65 minutes. At the end of the match, the governor first presented the Cassar Cup to Archie Caunter and then a special gold medal to Nicholl in appreciation of his talents and loyalty towards the Sliema club.